William Davidson is driven by high risk and high reward. It’s what led him to choose amateur boxing as a hobby in the UK. It’s what inspired him to move to China and pursue a full-time MBA at Cheung Kong Graduate School of Business (CKGSB) in Beijing. And it’s what got him into the unpredictable world of bitcoin. Originally from Barrhead, a town just south-west of Glasgow, Scotland, William got into boxing with his local club while studying Law and French at university. A mixed record of eight fights, four wins, and four losses followed. “It was good character-building,” William smiles. While at university, William started taking Chinese classes, drawn by tales of a booming economy with a thriving technology and startup scene. 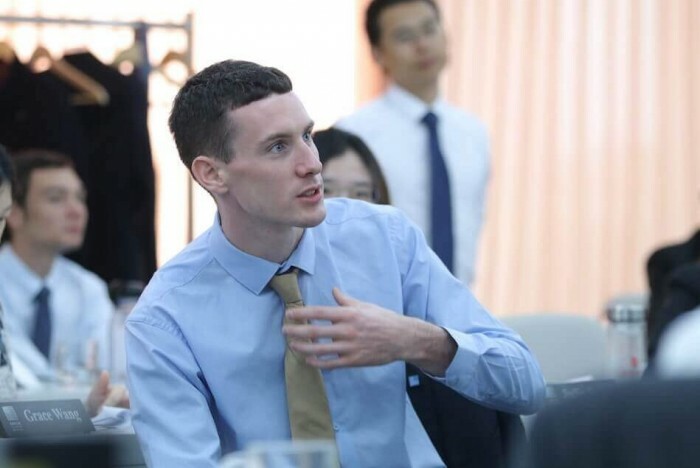 He travelled around Europe, studied in France on exchange for a year and had a stint working abroad for IBM in Italy before deciding to take the leap and relocate to China for a master’s degree in Chinese Law in Hangzhou, nearby Shanghai. An MBA, William says, was never on his roadmap. But whilst in the UK, working with a friend he began building a sports education startup serving Premier League soccer academies. An MBA, he thought, would give him formal business training as well as a foothold within the Chinese business community. William applied to top-ranked MBA programs in China and Hong Kong. Cheung Kong Graduate School of Business (CKGSB) in Beijing, stood out, William says, for its strong alumni network, independent faculty governance and prestigious reputation in mainland China. Set up in 2002 in Beijing with financial support from the Li Ka Shing Foundation, more than half of CKGSB’s 10,000 strong alumni—including Alibaba founder Jack Ma—are at CEO or chairman level, and collectively they lead businesses which account for one-fifth of China’s GDP. It was during his MBA in Beijing that William’s interest in bitcoin, blockchain, and cryptocurrency started to take hold. He wrote a dissertation on China’s regulation of cryptocurrency and blockchain applications. He joined forces with a CKGSB alum to build an Ethereum-based platform for fund and asset managers interested in entering the cryptocurrency space. William also dropped in on classes at the CKGSB Chuang Community—leading China tech startup accelerator which runs programs with Baidu, JD Finance, and Tencent—attending networking events and connecting with local tech entrepreneurs. And he organized a major blockchain event in Shenzhen for CKGSB in partnership with the London Stock Exchange as part of the Chuang Community’s annual Young Investors Forum, a roadshow where tech entrepreneurs pitch their startup ideas to venture capitalists and high-net worth investors from the CKGSB community. William’s event attracted over 150 attendees and speakers including IBM, London Stock Exchange, and Bitmain, the cryptocurrency mining Unicorn commentators have recently estimated to be worth around $15 billion. Through his CKGSB network, William began working as global PR manager at VIPKID, another Chinese Unicorn started by CKGSB MBA alumna Cindy Ma, who kick-started her educational technology English tutoring company through CKGSB’s Chuang Community. William’s most recent job, with Bitmain, managing global PR and marketing communications for the company, came from having kept in touch with the company from his CKGSB event in Shenzhen. Bitmain, headquartered in Beijing, is a world market leader in designing technology for bitcoin and cryptocurrency mining and operates the world’s largest and second largest bitcoin mining pools. China is the largest market for bitcoin mining, the process of using supercomputer chip-based hardware to generate new bitcoin cryptocurrency. Around 40% of bitcoin miners are based in China. While bitcoin’s value boomed in January this year, recent weeks have seen a sharp decline. It’s legal to hold, buy, and trade bitcoin in China, but government restrictions on cryptocurrencies and volatility in the market continue to be sources of concern. For William, the risks may be paying off. He’s recently switched from Bitmain for a new venture in the cryptocurrency industry. He’s settled in Beijing with his Chinese girlfriend and is even thinking about taking up boxing again. “Expats joke that in China, ‘Everything is possible, but of course nothing is easy’,” William smiles. “Cheung Kong Graduate School of Business has been a catalyst for my growth here – it has opened up a world of professional relationships, friendships and business opportunities.